I’ve never leased before, so this is all very new to me. I usually finance, but in this case it seems like the deal is too good to pass up? The dealer is saying that they’re offering $12500 off 2019 Acura MDX with either Tech or Advance package. 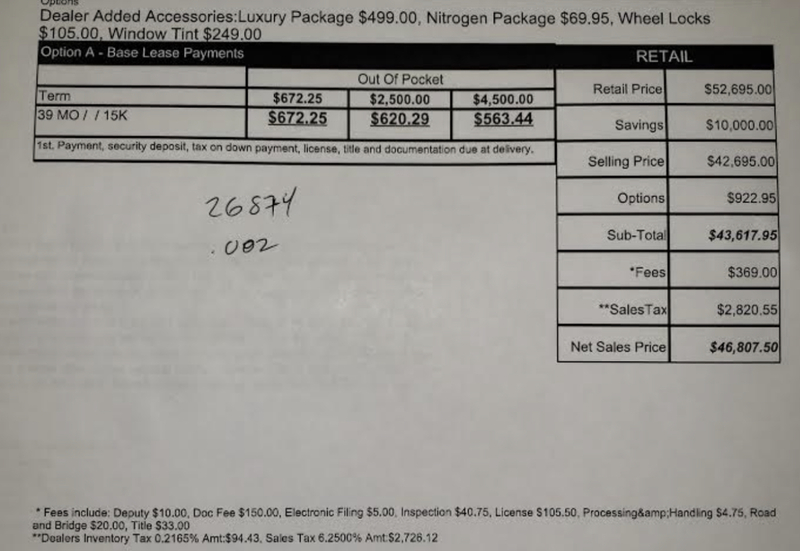 They gave me the below numbers for an Acura MDX AWD w/ Tech package priced at $52,695 MSRP, $40,195 after discount (plus fees). It feels like even if I wanted to purchase this vehicle at the end of the lease term it would end up being less if I financed it(since the incentives are no where near $12,500). Is it possible to just pay for the lease amount in a lump sum up front and reduce interest? Is this all too good to be true or am I missing something? Thanks for your help! Ask them for the full lease worksheet. You are getting 12k off yet the payments seem high. Just because they discounted by 12k doesn’t mean they didn’t add in a ton of extras which cuts back on the discount. I agree this deal is fishy. Awesome, thanks for the advice.I’ll do that! I did tell them that the standard miles allowed probably wouldn’t work for me, so I guess that’s why they came back with the larger allowances (which I didn’t know was possible on a lease). And unless you’ve done this before or are a good negotiator and can say no, you will end up with a much higher lease after the “finance” guy is done with you. These are the smoothest, best salespeople…they prey on your fears (as does all insurance) and your desire to finalize the deal (easier to say yes than no). Most people, on average, should use a good car broker. Not only will the average person save money, but tons of time too. You need to know money factor and residual value since it’s a nonstandard amount. Also confirm it’s Acura Financial is the bank. It’s really obnoxious to add almost $1K is dealer add-ons. Payment seems very high as these MDXs have consistently around $425/month since November. Even if 16K was 54% residual, it would be like $465/month before tax based the numbers below. Thank you all for the help and advice. I decided not to bite on this one! I’ve been asking around about the 2019 Acura MDX still, and I posted a deal before but this time asked more questions. The sell price seems pretty good, but I don’t think this is a great lease deal (despite what the dealer is telling me), but this time around I had enough sense to ask for the MF and RV. I tried plugging the #'s into the leasehackr calculator, and can’t quite get these numbers to look right in there. What am I missing here? Any thoughts on this? I plugged all of the numbers in to the calculator and the only way I could get close to the monthly payments was by bumping the residual to .004, although the dealer said it’s definitely .002 and they can’t change that. Pretty sure with Texas you need to use the center tax button on the calculator, also use the $43k price as the sales price and put the $595 acq fee back in. I think it’s still off so I suspect the mf is inflated. Do NOT accept any dealer add-ons… they are pure profit for the dealer and you are paying the full price across the terms of the lease, so about $30/month. You could get $2K+ more of options instead since you are only paying for the depreciation in that scenario. Ahhh…thanks. Included a link to the updated calc below. Still doesn’t quite add up, does it? What does an inflated MF mean? How do I determine that? I did confirm that it was the # above, and he insisted they can’t change that. Good advice! I did plan on trying to negotiate that, but even with that removed it doesn’t quite add up to their monthly payments. I’m trying to figure out how they arrive at these numbers? Did you get exact numbers for your area from Edmunds including RV, MF, and incentives? Looks like there is strong lease cash available on the MDX ($6,250 in some markets) so their discount may not be as good as you think. Don’t rely on the dealer for this.